The Nepal aviation authority announced last December that the Tribhuvan International Airport (TIA) would be closed daily from 22:00 (local time) to 08:00 starting April 1, 2019, through June 30, 2019, – smack in the middle of the pre-monsoon trekking and climbing season. Due to a limited construction season with winter conditions and summer monsoons, they had few good choices. For most flights, this will be an inconvenience but for flyers to Lukla with it’s notorious weather delays, especially in late morning, it’s a show stopper. In fact authorities have cancelled all direct flight from TIA to LUK suggesting that people fly out of Manthali Airport in the Ramechhap Provence – a 4 hour drive from Kathmandu. 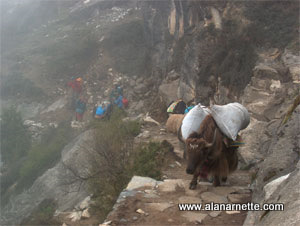 One obvious solution is to do what many guides have been doing for some years now and that is fly from Kathmandu to Namche Bazaar by helicopter. Of course it is a bit more expensive and a hassle to get all the duffel bags there and most helicopters only carry four passengers but it is a workaround. Otherwise plan on adding a few days to your itinerary to travel to Ramechhap. I guess there might be a change of mind and allow fixed-winged flights to attempt to fly to Lukla after 8 am, but it’s well known for Lukla to become socked in during the spring as early as 9 or 10 each morning with low clouds making an already dangerous approach, even more deadly. But when its clear, I’ve seen 100 flights get in and out … so there is a chance! Remember, sometimes just getting to Everest is half the battle!